William Hill offers a full-featured mobile sports solution. 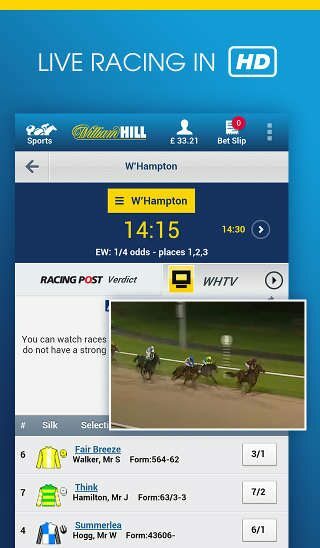 The William Hill Mobile App, available to most iOS and Android phones and tablets, offers all the functionality you will need and more, such as live video streaming. And if there isn’t an app for your mobile device, you can just as easily perform all your sports betting functions from the William Hill mobile website. 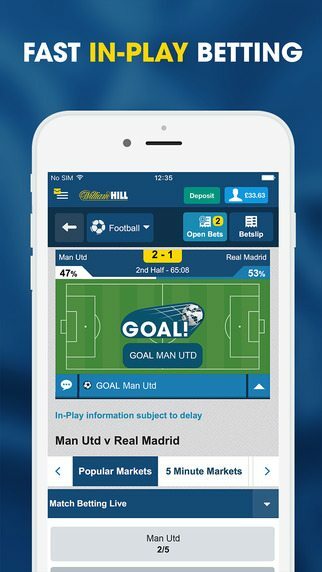 Additionally, you can also place bets via telephone, by text message, or in person at any William Hill betting shop. Open a single account at William Hill and access the features and functions of all of William Hill’s services, and do it from your mobile! Register with William Hill promo code C30 and receive £30 in free sports bets. Click here to redeem at William Hill. 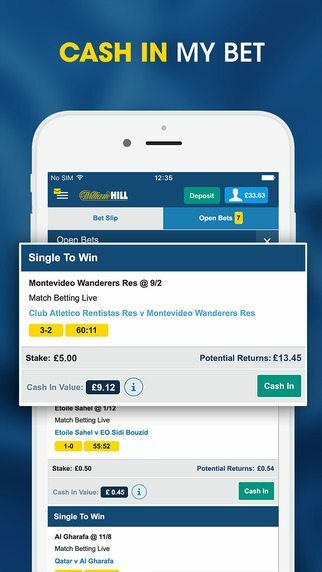 Register your William Hill Mobile Sports account and download the app! To get started, you will need to register an account at William Hill. Click here to visit William Hill and click the JOIN NOW button. Fill out the registration form and enter the William Hill promo code C30 during the process. Redeeming the promo code C30 will qualify your account to receive THREE free sports bets worth £10 each, for a total of £30 in free bets! You will receive these free bets regardless of whether you install the iOS app or the Android app. Find more details on this William Hill Sports promo code here. Once you have registered your new William Hill account, visit WilliamHill.com on your mobile device to download the app of your choice. 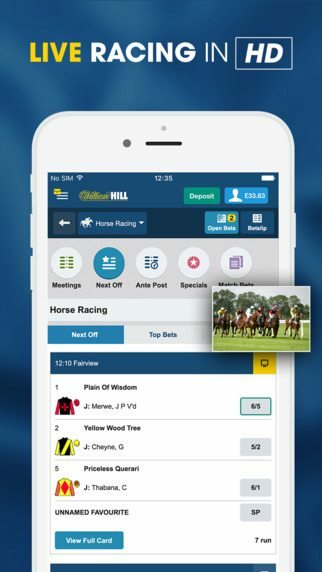 The William Hill mobile sports app is available for iOS devices running version 6.1 or higher and Android devices running version 4.1.2 or higher. The William Hill mobile sports app also has a new iPad version available. Users who have an iPhone, iPad, Android smartphone, or Android tablet can opt to download and install the appropriate William Hill app or access the mobile website directly without installing an app. For any other mobile device, the mobile browser must support Java and the user would have to access the William Hill mobile website directly. 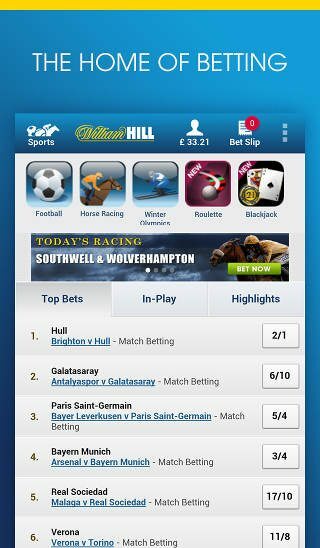 You can download the William Hill mobile app for your iPhone or iPad directly from WilliamHill.com or from the Apple App Store. Click here to visit William Hill and download the app! 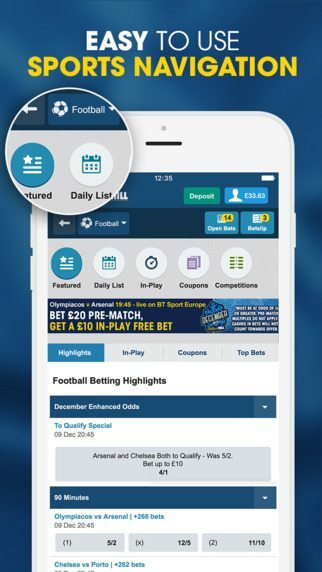 The William Hill app offers many of the same exciting features as the William Hill website, including in-play betting, the Cash In My Bet feature, accumulators, and the ability to watch live racing in HD! The iOS and Android apps are similar and consistent, as is the William Hill mobile website version. App users get the latest football scores and sports betting odds on the go, including real-time betting results across all the sports you follow at William Hill online. Both iOS and Android mobile apps provide total account management. Everything’s possible once you install the mobile sports app – place a wager on any market and deposit and withdraw winnings all from the app. Clients can have the entire William Hill experience via the app. Players can access their account, the banker and the support system directly from the app. To get the William Hill mobile app for Android, you must download it directly from William Hill. Visit WilliamHill.com with your Android device and download the free app. The app is 1.8MB. 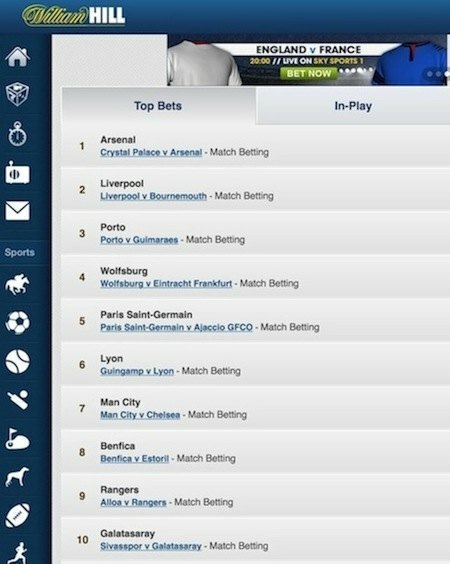 Bet on your favourite teams and all the same sports markets found online at WilliamHill.com with the Android App. Just like the iPhone App, the William Hill Sports Betting Android App offers all the same industry-leading betting features, such as in-play bets, accumulators, popular William Hill “Top Bets”, live video streaming, and more. 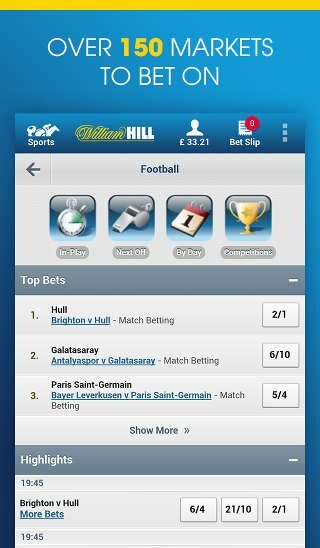 First, you must download the William Hill Android App directly from WilliamHill.com. Visit WilliamHill.com with your Android device and download the Android app. Store the application file – which has a file extension of .apk – on your Android device. You will then have to install the application manually. Google does not allow any gambling apps in the Google Play app store, so we must manually download and install the app directly from William Hill. William Hill develops, hosts, and distributes its own Android apps so rest assured that the app is safe and trustworthy. Next, you will need to modify your Android settings. Under “Settings”, select “Application Settings” or “Security” and click “Unknown sources”. 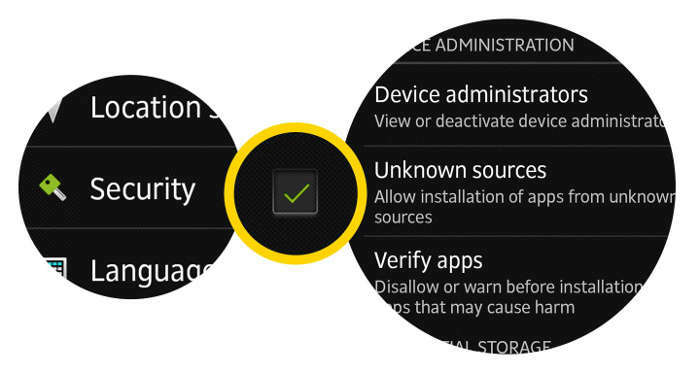 Android categorises any apps downloaded from outside of the Google Play store as an unknown source – this does NOT mean that the app is unsafe or coming from an unverified source. 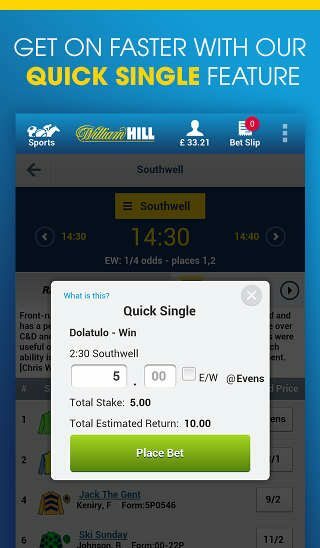 Once the Android app is installed, you can revert your settings back by unticking “Unknown sources” and the William Hill app will continue to operate fine. Lastly, we must install the downloaded Android App. Got to Apps and select Downloads (or alternatively find the downloaded app file using a file manager). Select the downloaded .apk file to install the William Hill Android app. When prompted, confirm you wish to install the file. 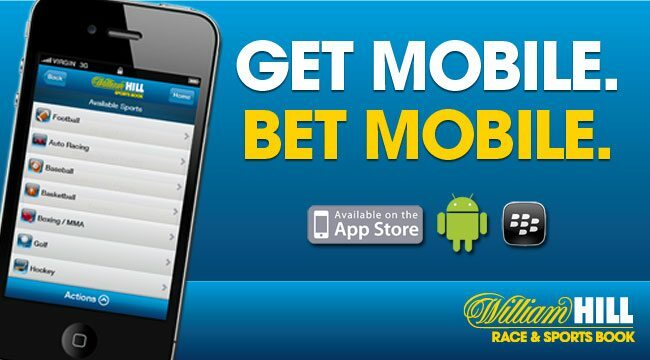 The William Hill mobile app should now be installed on your Android device. The new customer welcome bonus offer – bet £10 and receive £30 in free bets – is available to mobile customers. The one promotion that is always popular is the William Hill free bet welcome package. We have an exclusive offer from William Hill, offering two (2) £10 free bets, which is a 200% matched bet bonus, and double the standard offer. The £20 in free bets offer is available to all new clients and also applies to mobile betting. To claim the bet, simply enter the William Hill promo code “C30” during the registration process at William Hill as shown above. Then place a bet of at least £10; win or lose, William Hill will gift you 3 free bets of £10, for a total of £30 in free bets. We recommend visiting Freebetpromocode.co.uk for more information on this offer as well as other free bets you can cash in on! · Stake any Live Channel 4 horse race; if your horse comes in 2nd, you’ll receive your bet back – making it a free bet! · ACCA Insurance: If you choose a 6 team football accumulator (or more) and only 5 teams win, your stake will be refunded as a free bet! · Choose a 1st goal scorer; if they score only 2nd, your losing stake will be returned as a free bet! · Place a Correct Score Bet, and if the match finishes at 0-0, we’ll reimburse your losing correct score bets as well as double result bets as a free bet! · In–Play Football: For every league, with current stats on goals, cards, and corners for every market. · In-Play Tennis: Court action doesn’t get better than this play-by -play betting, with Wimbledon-style scoreboards from Grand Slam events to Challenger tour matches. You do not have to install an app to utilize the mobile features of William Hill. If you have a mobile device other than an Apple or Android, or prefer not download and install an app, you can simply use the William Hill mobile website. When registering your new account, we always recommend setting up your account with your computer and making your deposit first as we think it’s much easier. So with your computer, players can sign up via the website, and then switch to their mobile device to log in to the mobile website. 1. Using your computer, click here and register a new sports account and then make a deposit. We recommend that all users enter our exclusive William Hill promotional code C30 to be eligible for our special £30 in free bets welcome package. During the registration process, just enter the promo code C30 as mentioned above. Then, after placing your first sports bet of just £10 or more, you will THREE FREE BET COUPONS worth £10 each, for a total value of £30! Visit http://freebetpromocode.co.uk/promo/william-hill-free-bet/ to learn more about this exclusive offer. 2. 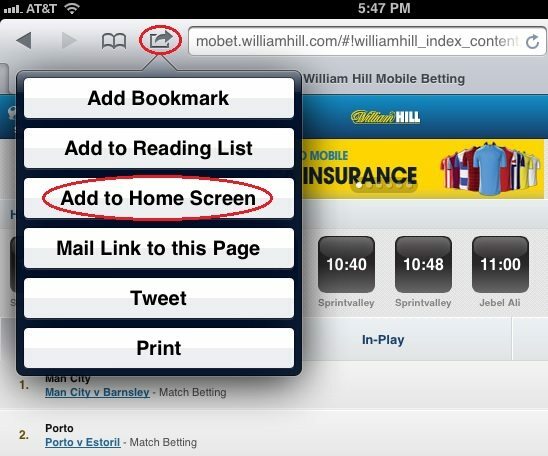 Now, open your browser on your iPhone or iPad and type in “mobet.williamhill.com” in the address bar, then press “Go”. Don’t worry if the URL changes or redirects. Placing a bet is very easy. You can select the sport along the left side navigation and browse the specific events you are interested in. Once you make a selection, the bet will be added to your Bet Slip on the right side. Enter the bet amount in the Bet Slip. The Bet Slip will show you your potential winnings. Click the Place Bets button once you are done! Ready to place some bets? Sign up to William Hill Sports here! You can find another list of available William Hill promo codes here. massive amount of features on the mobile site and easy to switch between sports and casino. easy to use interface. you don't need to download any app - just visit the site on your mobile and log in. free bets can be redeemed and used on your mobile also. I have the William Hill Mobile app for iPhone and it's great. The promo code worked too so I received the free bets and you can use them from within the app. I bet on football, horses and some others and the app is a quick and simple way to get in my bets. I can place a bet at the pub in like 10 seconds. Highly recommend the app if you are a member of Will Hill.